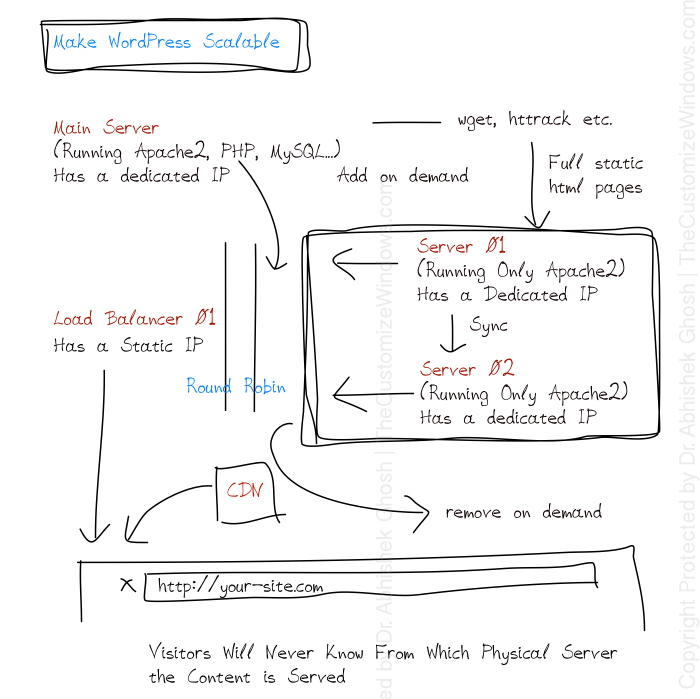 Make WordPress Scalable By Creating Different Nodes Composed of Servers Running Only Apache2. You Can Simply use wget and use loadbalancers. People in general ask for Converting HTML to Websites WordPress or PHP Websites to WordPress Without Any Change in URL. The basic reason is nothing – WordPress actually offers the versatility of having a good HTML output plus few PHP based functions. So, this is the basics of how we can Make WordPress Scalable – insanely faster loading because there is no PHP, MySQL. wget – Downloading or Cloning a Full Website in OS X and Linux with wget. Instead of Mac, Server 1 (or even Server 2) is/are the “Mac” in our case. wget has the advantage of scripting, scheduling, updating the new etc. We think, you should create a JSON or XML based widget for fetching “recently posted” things for us! Well, if such JSON or XML based widget for fetching “recently posted” things are realized; category also will not require update. We personally dislike using any such “non-static” way though. PHP is added for safety. There might be ugly URLs generated by some Plugins – for that we added PHP part too. Comment form is not needed these days – you should ask to react on Social Networks, not on site; it saves a huge computing power, make the webpage more relevant to the bots. Actually Google bots will understand that you are static HTML files, possibly your Page Rank will increase. You always have the way to switch off – its not anything permanent! Comment Page must be a custom one – you should use somer system which has no PHP function. This Article Has Been Shared 8925 Times! Cloudpaging is based on Virtualization, applications are pre-virtualized, encrypted and split into pieces. System intense Apps or Games can take the advantage. Cloud Computing Airline Industry might appear to most as separate and unrelated. Fact is, Airline Industry needs space on centralized host and softwares. SoundCloud is an online platform for musician and audio enthusiasts for distributing audio files. It serves as co-operation platform for the audiophiles. Cloud Server and Cloud Storage right now has quite good competition.Appropriately it can be compared with virtual marketplace.Here is overview of Cloud Market. Cite this article as: Abhishek Ghosh, "Make WordPress Scalable : The HTML Conversion Way," in The Customize Windows, April 17, 2014, April 25, 2019, https://thecustomizewindows.com/2014/04/make-wordpress-scalable-html-conversion-way/.